Social news curation app News.me is bowing out and you’ll no longer find it up in the App Store as of today, although existing users who have downloaded the app will receive continued support. 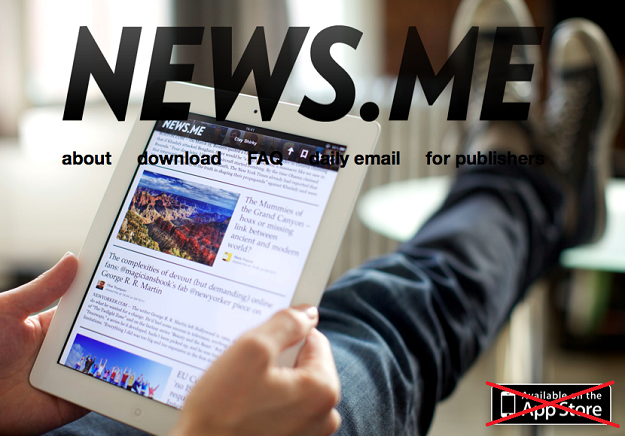 You can still receive the latest news shared by your friends in News.me’s email digest, and all current users of the News.me app will be supported by the team. This just means that if you’ve wanted to download the app to your iOS device but never got around to it, you’re out of luck. The next best option is to sign up for News.me’s email digest, which will send your friends’ shared news straight to your inbox. It’s unknown how long current user support will last. After all, the mark of a successful news reader app is the number of users it’s able to attract. He posted some promising numbers about Digg’s relaunch that seem to suggest the site has a good chance of being resurrected from near death. According to Levine over one million people have visited the new Digg and only three months after Digg’s iPad and iPhone apps were released, its mobile app user numbers are nearing those of desktop app users. Levine then pointed out a chart from The Atlantic, indicating that Digg appears to send more referral traffic than StumbleUpon. If you’re bummed about the stats of News.me, Digg is a viable substitute with the same team and technology behind it. Of course the bigger takeaway from the shuttering of News.me is that yet another Twitter app has had to shut down or switch tactics since the API restrictions were handed down.